This action was one part of the Local Time Horotiu project St Paul St Gallery April/May 2012. 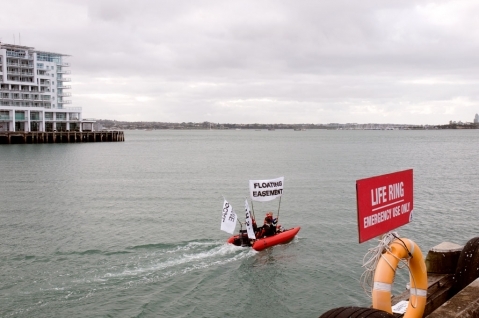 Local Time made actions in the Queens Wharf, Princess Wharf, Te Kapua and Okahu Bay areas of the Waitemata Harbour. The on-board actions began in the ferry terminal area aboard "Mahi Kai", 3.00pm-5.30pm, 28th April 2012, the same time as the 'Aotearoa is not for sale' hikoi departed up Queen St. These flags were all flown from bamboo shoots and mounted in fishing-rod holders on the transom of Mahi kai. The bamboo flag-poles were cut and collected from the Elam School of Fine Arts the morning of the action & hikoi. Mahi kai is a red 13.8 meter thundercat rigid inflatable race-boat. Thundercat preparation Te Atatu Ramp, Te Atatu, 26 April, Alex Monteith, Natalie Robertson & Lawrence Makoare.